You've had a brain injury or stroke and certain things in your daily life are affected, but not everything. You know your injury was on the right side of your brain. So, why are you having trouble with actions on the left side of your body? Here's a quick explanation of which side of the brain is responsible for what types of thoughts, emotions, and actions. You might be surprised! Your brain is amazingly complex. It allows you to accomplish all kinds of feats every day, from simply picking up an apple off a table, to singing, reading, speaking, understanding or feeling emotions. The human brain is so complex that scientists are still making new discoveries about how it works. The right side of your brain controls the left side of your body, and the left side of your brain controls the right side of your body. Interesting, right? The two sides of your brain are similar to one another; for example, the part of your brain that tells your arms and legs to move is the same on the right and left - it just controls different sides of your body. What's the difference between the right side and the left side of your brain? You can also request a copy of the Right Brain vs. Left Brain to be mailed to you. The left side of the brain is concerned with language, number skills, reasoning, scientific skills, spoken language and right-hand control. The left side is the hub of language, where you "assemble" the language (words and sentence structure) you want to communicate. This is not to say that the right side of your brain has no involvement with language; the two sides of your brain work together to perform functions such as understanding, reasoning and organizing language. We know from patterns of brain damage (for example: stroke, traumatic brain injuries or brain tumors), that when the left side of the brain is damaged in the areas that have been associated with speech production and language comprehension, people present with Aphasia (difficulty comprehending and/or expressing language). These language difficulties are (in almost all situations) not seen if the same damage is done on the right side of the brain. So we know that the left side of the brain is very important for language and understanding. Other functions of the left side of the brain are analytical, logic, and computation skills. The right side of your brain is in charge of visual awareness, imagination, emotions, spatial abilities, face recognition, music awareness, 3D forms, interpreting social cues, and left-hand control. It performs some math, but only rough estimations and comparisons. The brain's right side also helps us to comprehend visual imagery and make sense of what we see. It plays a role in language, particularly in interpreting context and a person's tone, staying on topic in a conversation and organizing your thoughts and ideas. What if my brain injury or stroke is on the LEFT SIDE of my brain? 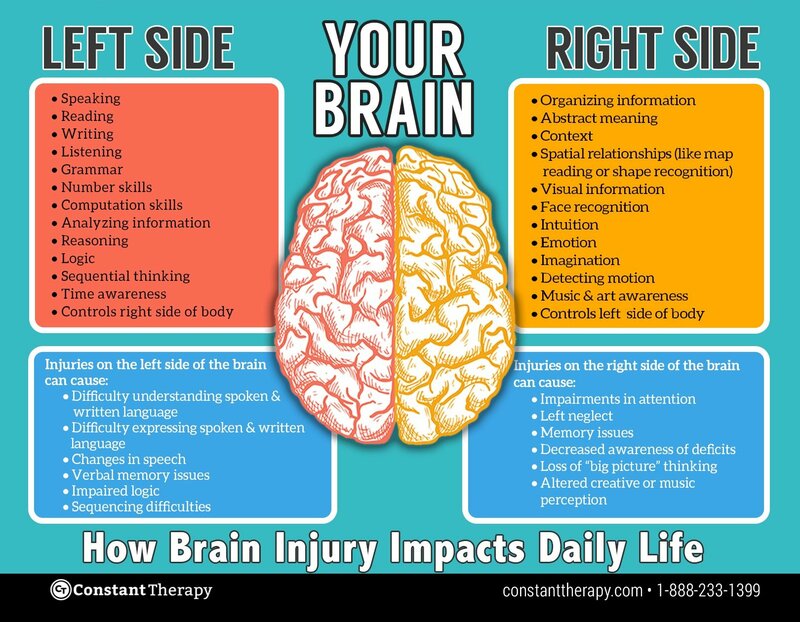 What if my brain injury or stroke is on the RIGHT SIDE of my brain? Attention: Difficulty concentrating on a task or focusing on what is said or seen. Social communication: Difficulty interpreting abstract language such as metaphors, making inferences, understanding jokes, and nonverbal cues. Organization: Difficulty with arranging information and planning, which is often reflected in communication difficulties, such as trouble telling a story with events in the right order, giving directions, or maintaining a topic during conversation. Orientation: Difficulty recalling the date, time, or place. Constant Therapy is a cognitive & speech therapy app that helps people with brain injury, stroke and aphasia recover key speech and cognitive skills – like memory, math, reading, writing, counting change, and more. Built and tested by a team of top neuroscientists and clinicians at Boston University, Constant Therapy has proven effective in multiple peer-reviewed, published research studies. Both clinicians and patients can download and use Constant Therapy.